Free Video Joiner - Free Video Joiner Software - Tutorials - How to Merge Video Files into A Single One? Tutorial - How to Merge Video Files into A Single One? There must be times when you need to combine your beloved videos for gapless enjoyment. 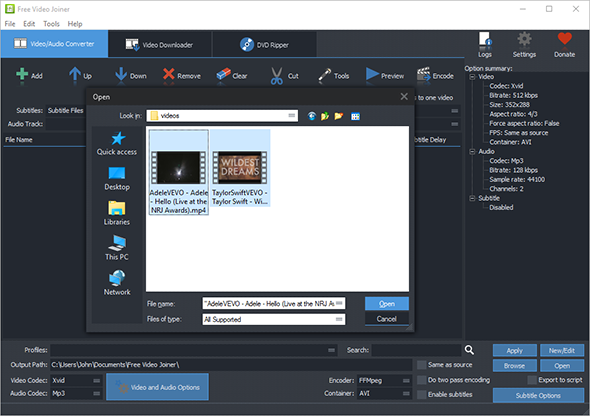 Free Video Joiner is just designed to join unlimited number of video files into a large one for convenient uses like online posting, sharing as well as DVD burning. Click "Add" and choose "Add File" and in the popped up explorer window, choose the video files you want to join together and click "Open", then you will see the videos listed in the program window. 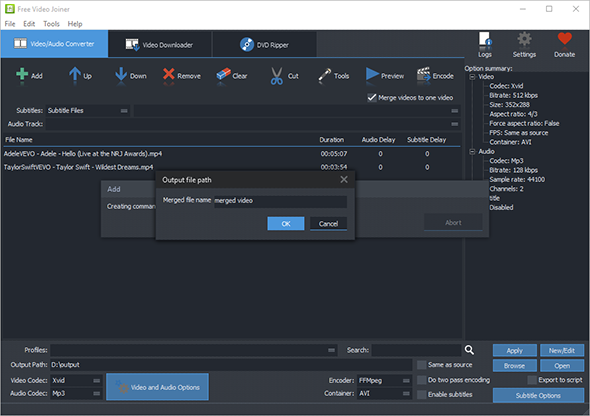 If needed, "Add Folder" or "Add Folder Tree" can also be used to import video files conveniently. To activate video merging engine, check the option of "Merge videos to one video". In "profiles" menu, choose one of the ready-made presets for your devices. If needed, you can choose the video/audio codecs and edit the profiles. Then, click "Browse" to choose an output folder for the merged video file. When all settings are ready, click "Encode" to start video joining and a new window will pop up, just input a name for the merged video file, then click "OK". When the process is finished, click "Open" to find the joined video.